We knew it was going to be cold today in the wake of our overnight snow and sure enough, the numbers bear that out. Denver recorded a low temperature of 15 degrees below zero at 7:14pm. This easily bests the record low for December 17 of 13 degrees below zero set in 1909. Here in Thornton, we managed to stay warmer, although with these extremes, that isn’t saying much. 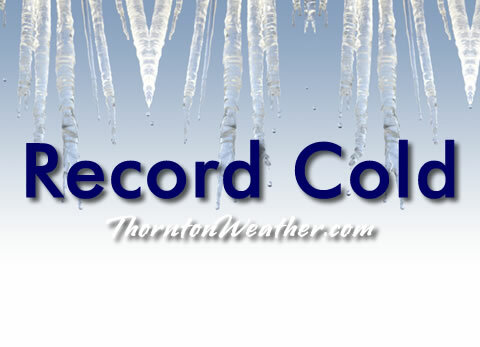 Thornton hit a low of 10.7 degrees below zero at 5:57pm. The storm system brought 5.8 inches of snow to Thornton, our biggest snowfall of the season. Out at DIA where Denver’s official measurements are kept, 8.0 inches fell. Stay up to date with Thornton’s weather: Be sure to ‘like’ us on Facebook, follow us on Twitter and add us to your Google+ circles. This entry was posted on Saturday, December 17th, 2016 at 8:14pm MDT and is filed under Thornton Weather. You can follow any responses to this entry through the RSS 2.0 feed. You can skip to the end and leave a response. Pinging is currently not allowed. I experienced a think heavy fog last night while traveling on 104th between Mckray and 185….around 8ish…by the grace of GOD i made it through….can you please explain what i went through…. Joan, coincidentally my wife experienced the same fog coming home from the airport that night. She said it was as thick as she had ever seen. It really isn’t unusual to see fog occur in that area although it was quite extreme this time. It is caused by evaporation of warmer water from the river hitting the cold air above causing it to condense and form the fog.